P200E clutch: 23 tooth helical cut central gear - crank side. 7 springs around the perimeter. 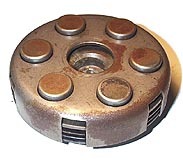 VBA Clutch: Similar to the P200 clutch but with only 6 springs and a different drive gear.